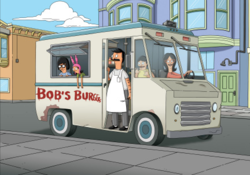 "Food Truckin'" is the fifth episode of the second season of Bob's Burgers. Bob and the family buy a food truck to compete with the others that are stealing their customers. When the Lolla-Pa-Foods-A-Festival comes up, they bring the truck, and the kids decided to cause some mischief. Unfortunately, this causes a riot at the festival. "The Belchies" • "Bob Day Afternoon" • "Synchronized Swimming" • "Burgerboss" • "Food Truckin'" • "Dr. Yap" • "Moody Foodie" • "Bad Tina" • "Beefsquatch"